The android Lt Commander Data has often been called upon to perform his duty to the UNITED FEDERATION of PLANETS by defending it from the numerous threats and enemies that might challenge it`s liberties and freedom. As one might expect from a synthetic life-form, Data has worked tirelessly for Starfleet, serving as a line officer aboard the U.S.S. Triploi NCC-37124 and later aboard the U.S.S. Enterprise NCC-1701-D and NCC-1701-E. The many challenges to the peace and harmony of the Federation come in several different forms-some are aggresively adversarial races such as the ROMULANS, the BORG, and the CARDASSIANS, while others are individual beings such as the omnipotent Q and the alien CRYSTALLINE ENTITY. The latter is, in fact, the first threat to life that Data ever encounters, shortly after his construction in 2335, six years before he joins Starfleet. At this time, Data was in a deactivated state pending assimilation of new programming taken from the colonist population of Omicron Theta, and as such was the sole survivor of the entity`s first attack. The massive, snowflake-shaped being goes on to attack 12 more worlds over the intervening years, including the planet FORLAT III. Data twice more encounters this destructive and dangerous life-form. The first reunion occurs in 2364, when his android "brother" LORE makes contact with the creature, the second is four years later, during a survey by the Enterprise`s crew of the planet MELONA IV. The Crystalline Entity is responsible for several deaths at this time. Adhering to the peaceful tenents of the Federation, however, Data and the Enterprise crew attempt to make contact with the creature, through the use of FOCUSED GRAVITON PULSES, in order to convince the entity to stop the attacks before they are forced to destroy it. This laudible attempt at reconsiliation is thwarted by by the actions as DR KILA MARR, the mother of RAYMOND MARR, one of the colonists killed by the entity during it`s attack on Omicron Theta. Data, along with his fellow crewmates aboard the Enterprise, has also found himself at the mercy of the omnipotent lifeform known as Q on a number of occasions. The android`s first encounter with Q is at the very start of the Enterprise`s mission in 2364, Q abducts members of the Enterprise bridge crew, includind Data, to take part in a recreation of a post-atomic horror courtroom. Unfettered by human emotional responses, such as fear and apprehension, Data confronts Q when the being challenges them with legal technicalities. Data`s accurate memory enables him to hold Q to his own rules and allowsCaptain Jean Luc Picard a chance at thwarting their captor. Over the new year of 2368-9, Data becomes personally involved in a complex plot by a race of alien invaders from DEVIDIA II, using time-travel technologies to generate an artificial temporal rift, the Devidian`s have apparently been travelling to San Francisco, Earth, in the 1890`s. Among the clues to unraveling this mystery is Data`s severed head, which apparently has been buried under the city for centuries. When the andriod investigates the Devidian homeworld, he is catapulted into the past, wher the aliens are at work harvesting the life energy of dying Cholera victims for their own sustenance. The android exposes the Devidian operation, and is rescued by a team from the Enterprise. Some threats to the security of the Federation have seen the andriod go to war against the enemy. During the destructive Klingon CIVIL WAR of late 2367, Data is given temporary command of the Starship U.S.S. Sutherland NCC-72015. As part of a blockade fleet, commanded by Captain Picard aboard the Enterprise, Data orders the use of a TACHYON DETECTION GRID to waylay Romulan supply ships under the control of SELA. Data is again faced with Sela`s cunning machinations some months later, when he and Captain Picard take part in a covert operation on Romulus to discover the whereabouts of VULCAN AMBASSADOR SPOCK. The Romulan officer`s plan to lead a covert invasion force to Vulcan are thwarted when Data, Spock,and Picard work together to reveal the invaders. The most personal an insiduos threat to the Federation that Data has faced has come from the technilogically augmented species known as the BORG. In 2365, Data is among the first Starfleet officers to confront the Borg face to face, during an away mission to a BORG CUBE. When the aliens reach Earth in early 2367, Data is forced to directly link his positronic brain with the BORG COLLECTIVE consciousness via the mind of LOCUTUS - the assimilated Captain Picard. Data`s direct influence on the Borg and Picard`s strength of will, defeats the machinations of the assimilators on this occasion. In 2369, Data once again encounters Borg, interested in him, in the ruins of a Starfleet facility on OHNIAKA III. These Borg drones are cut off from the collective and follow the will of the being they call "THE ONE" - otherwise known as LORE, another android built by Data`s creator Dr Noonien Soong. Lore attempts to bring Data over to his side, but after a tense situation, Data manages to shrug off the effects of his brothers mind control and manages to disassemble his sibling. Data`s contact with the Collective is apparently registered by the BORG QUEEN, however, deep in the DELTA QUADRANT. When a temporal attack on Earth is attempted in 2373, her desire to convert the andriod to the Borg cause is clear, but he manages to resist her attempts to turn him against his Starfleet colleagues. 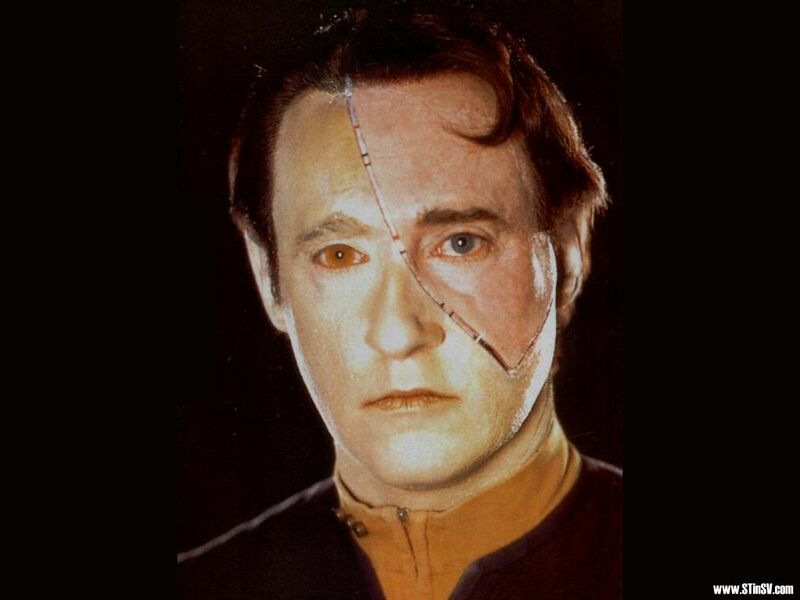 Data may be a machine, but his strength of personality makes him a force to be reckoned with for any potential foe.